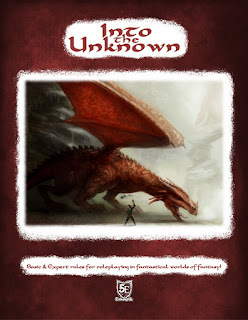 Quick intro: "Into the Unknown" is my hack of 5e to make it run more like B/X - Old school meets modern. Many simplified mechanics; Race-As-Class; reaction and morale rolls are back; spend-gold-for-xp combined with downtime activities; simple but central hexcrawl framework; terse and short writing - And fully compatible with 5e. Click the tags below for more. The player booklets are basically finished. Works has stalled a bit as I am working hard on the GM booklets. This is turning out to be a lot harder than the player booklets, but I want it to be good - And this is really demanding the best of GM wisdom from me! We're still a couple a months away from completion, but I have the structure of the booklet and just about every chapter and section lined up, so things should be proceeding more smoothly from here. So yeah, I think this is really happening. A target of 50 backers seems realistic - I won't run until I have all the actual material written and I enter the final edit-tweak'n'polish phase (I am thinking to use the kickstarter as playtest as well) and I have a firm price offer from a printer. Sometime in autumn? I guess that means I should look at stretch goals and stuff? I've never done anything like this before. Comission someone to make a kewl character sheet? Comission art from Russ Nicholson and Larry Elmore? I guess I will need to set up a company as well, to report taxes on this for and all. Jeez. I did not anticipate all this when I first started hacking this.